A week ago a few members from the TarWheels traveled to Columbia, SC for the annual Carolina Wheelchair Basketball Conference's (CWBC) conference meeting. The 11 teams of the CWBC were all represented to discuss bylaws, set each team's conference schedule, and vote in two new teams to the conference! Discussions went very well, especially considering the new alignment of the CWBC! We must first pat a couple members of the team on the back, Donnie Langford remains CWBC Treasurer, while Jennifer Langford was voted to change office from secretary to 1st Vice-President, and Brian Reinertsen (new to the team) was made secretary. Since one team, the Wilmington team folded and a N. Myrtle Beach team was formed, along with the addition of a Charlotte team, a North and South separation just didn't quite work. The 10 teams, plus one probationary team were voted on to be split into the Eastern CWBC and the Western CWBC. Teams are required to play two home and two away games at each of the teams in their division. 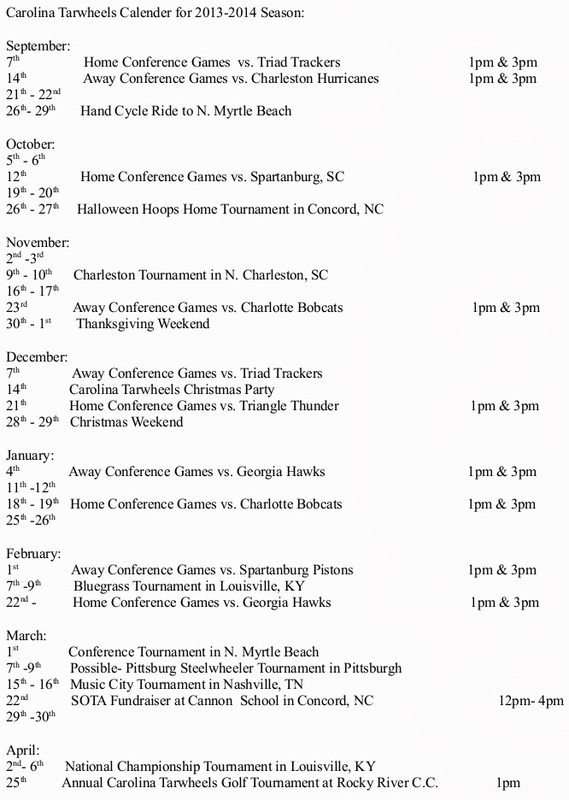 Noticeably the schedule includes more games than the required conference games for the TarWheels. 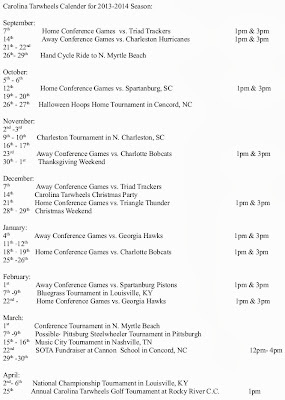 A couple inter-division games were added for good measure, plus who doesn't mind a trip to Charleston?! The tournaments scheduled will hopefully well prepare a run at the title in that little tournament you'll notice at the bottom of the schedule... The NWBA's National Championship Tournament! We've got a strong team this year as well as plenty of optimism and drive! Make sure to add your email address to the bottom of the column on the right of your screen, and you'll be updated as the season progresses! As always, thanks for your support!